Buy any 4 qualifying tires from participating supplier and receive a pre-paid Visa c ard in the amount of $50 to $100 depending on brand and tire size. Buy 3 get 4th for $1 offer is not offered on all brands. See store for details. 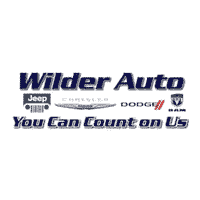 Wilder Chrysler Dodge Jeep Ram features the latest manufacturer offers and incentives on all new Chrysler, Dodge, Jeep, and RAM vehicles. Discover which offers are best for you and drive off in a new car today. In our experience, there’s no resisting the beautiful craftsmanship of the Jeep, Dodge, Ram and Chrysler models you’ll find in our showroom. If you are in the market for a new or used car, then you have come to the right place. Because if there’s one thing we love more than our lineup of new and used cars, it’s serving customers like you here at Wilder Chrysler Dodge Jeep Ram. We’ll help you find the car of your dreams from our stunning collection of new Jeep, Dodge, Ram and Chrysler vehicles. We know that all it takes is a test drive to fall in love with a new Jeep Cherokee, Jeep Wrangle, Dodge Durango, Ram 1500 or Chrysler Pacifica. Our new models have been brilliantly designed to assure your safety, comfort and convenience throughout countless miles of daily driving! Don’t hesitate to visit Wilder Chrysler Dodge Jeep Ram to take a closer look at our new inventory and get started on a test drive today. We certainly understand if you can’t find a new car that suits your driving needs or budget. Fortunately for you, we’re also proud to carry a wide selection of used car from top brands. Regardless of make or model, you’ll rest assured that each pre-owned car has been thoroughly inspected to guarantee its excellent condition to drivers like you! It’s not enough for us to help you find the new Jeep, Dodge, Ram, and Chrysler model or used car of your dreams. We also want to ensure that you take the wheel at a budget-friendly price. We can help find a financing plan that works best for you! Leave it to our auto finance center and you’ll be driving your new car in no time at all! Once you drive your new Jeep, Dodge, Ram and Chrysler vehicle out of our showroom, that doesn’t mean our relationship ends. Far from it, in fact. Our goal is to make sure your levels of satisfaction remain high for many miles, and we support you our Wilder Advantage program, which offers many bonus features including discount auto service and parts. Whether you’re researching a new car, seeking service for you current one or exploring finance options, we hope that you’ll visit us at 53 Jetta Way in Port Angeles, WA where you’ll always be well taken care of!